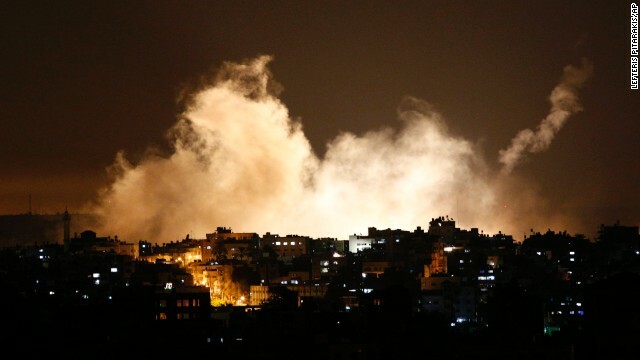 Gaza City (CNN) -- The death toll on both sides of the Gaza battle jumped Monday, as Palestinian officials reported scores more killed and Israel announced seven more soldiers died -- including several on Israeli soil. 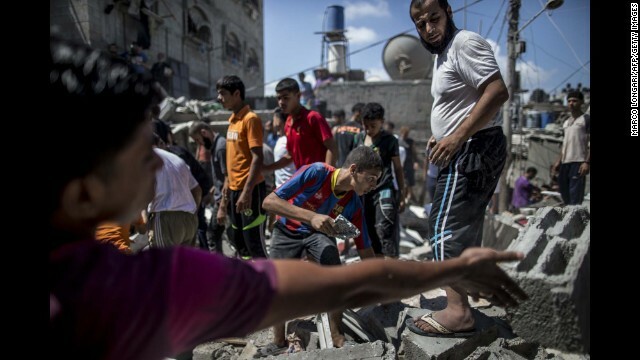 About 576 Palestinians have been killed, Gaza Health Ministry officials said. It's unknown how many were militants, but the United Nations has estimated that 70% are civilians. Israel has reported dozens of terrorists killed by its forces. 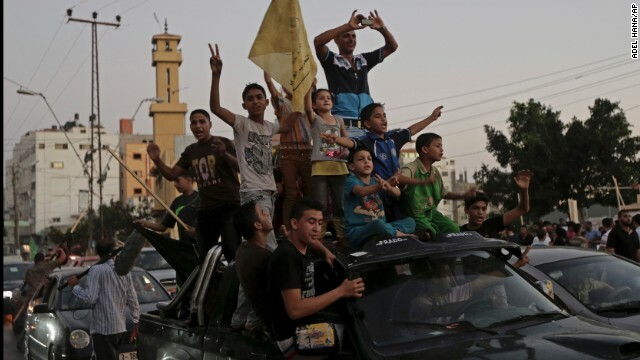 Palestinians in Gaza celebrate a ceasefire between Israel and Hamas on Tuesday, August 26. After more than seven weeks of heavy fighting, Israel and Hamas agreed to an open-ended ceasefire that puts off dealing with core long-term issues. Palestinians inspect the damage to a residential building following several late night Israeli airstrikes in Gaza City on August 26. Gila, center, mother of 4-year-old Israeli boy Daniel Tragerman, sits next to his grave during his funeral near the Israel-Gaza border on Sunday, August 24. 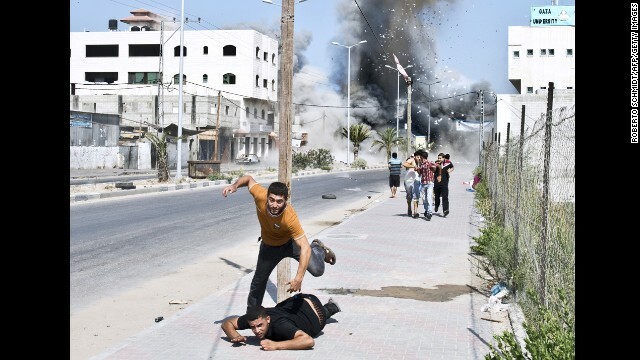 Palestinians run away from debris after a bomb from an Israeli airstrike hit a house in Gaza on Saturday, August 23. 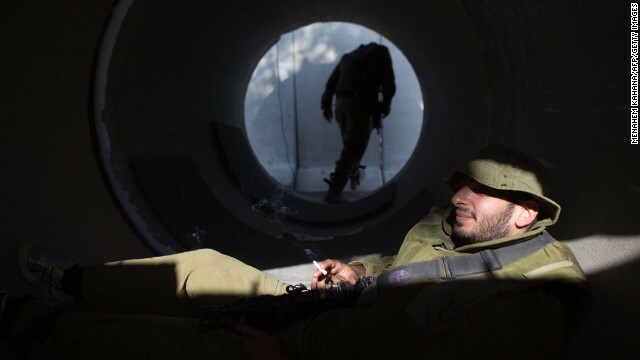 An Israeli soldier smokes a cigarette in a large concrete pipe used as shelter at an army deployment point near the Israeli-Gaza border on Wednesday, August 20. 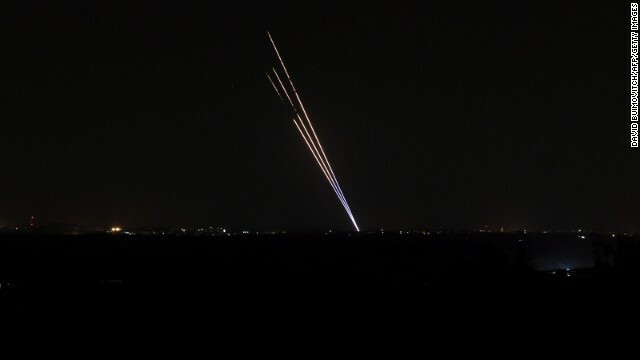 Light trails made by rockets fired from the Gaza Strip stand out against the night sky on Tuesday, August 19. 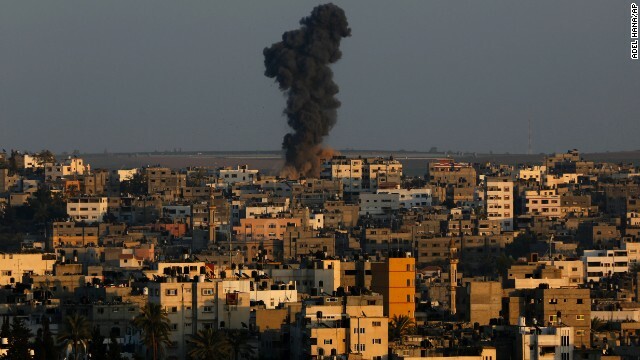 Despite efforts to come to a peaceful agreement, Gaza militants launched rockets into Israel on Tuesday, and Israel responded with its own rockets. 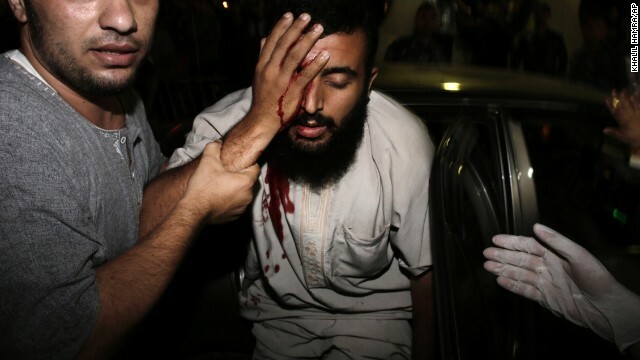 An injured Palestinian man is helped into the Shifa hospital in Gaza City on August 19. 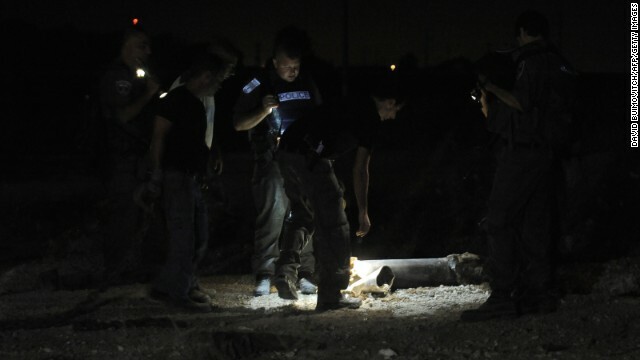 Police examine the remains of a rocket launched from Gaza that landed near the kibbutz of Yad Mordechay on August 19. 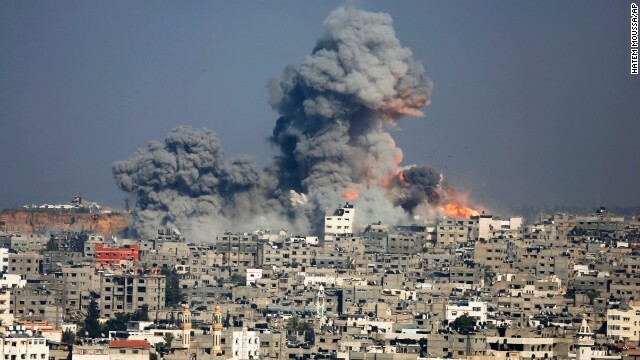 Smoke rises after an Israeli airstrike on Gaza City on August 19. 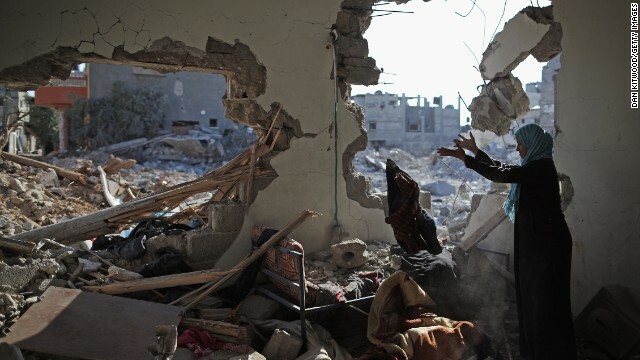 Islam El Masri begins to sort through the rubble of her destroyed home in Beit Hanoun, Gaza, on Thursday, August 14. 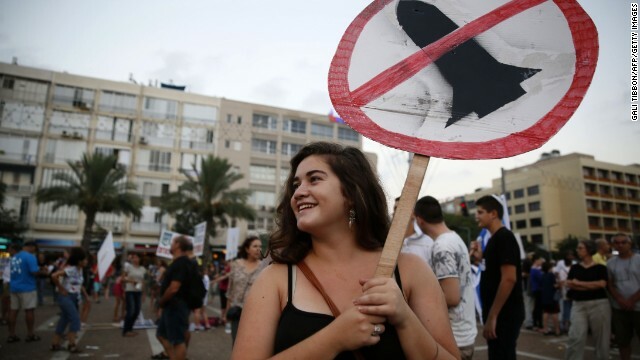 Israelis gather in Tel Aviv during a protest August 14 calling on the government and the army to end Palestinian rocket attacks from Gaza once and for all. 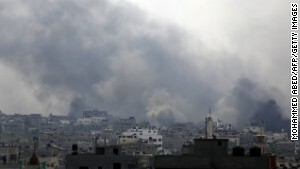 Smoke rises in Gaza City after an airstrike on Saturday, August 9. 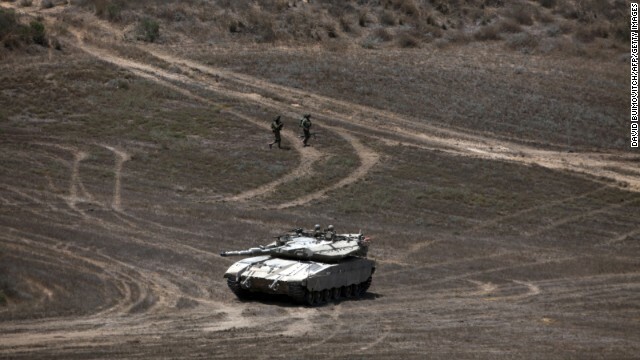 Israeli soldiers walk past a Merkava tank as they patrol a field near Israel's border with Gaza on August 9. A Palestinian boy salvages family belongings from the rubble of a four-story building after an airstrike in Gaza City on Friday, August 8. Israelis flee after a rocket fired from Gaza hit the residential neighborhood of Sderot, Israel, on August 8. 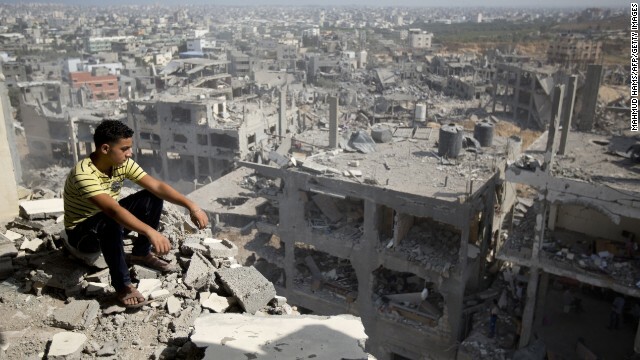 A Palestinian man looks out over destruction in the al-Tufah neighborhood of Gaza City on Wednesday, August 6. 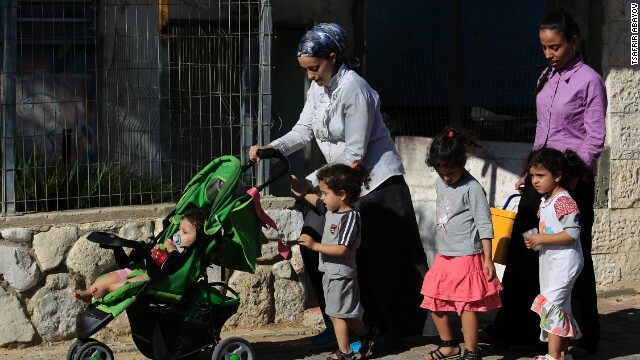 Displaced Palestinians carry their belongings as they leave a United Nations school in Beit Lahiya, Gaza, to return to their homes Tuesday, August 5. 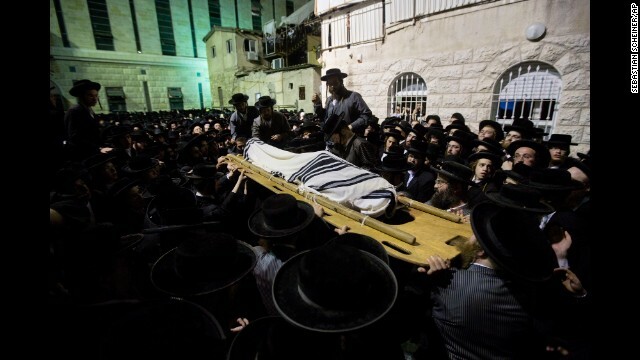 The body of Avrohom Wallis is carried during his funeral in Jerusalem on Monday, August 4. Wallis was killed in what Israeli police spokesman Micky Rosenfeld called a "terror attack," when a man drove an earthmover into a bus in Jerusalem. Israeli soldiers fire a mortar shell toward Gaza from the Israeli side of the border on August 4. Palestinians remove rubble from a house hit by an airstrike in the al-Shati refugee camp in Gaza City on August 4. An Israeli drone circles over Gaza City on Sunday, August 3. 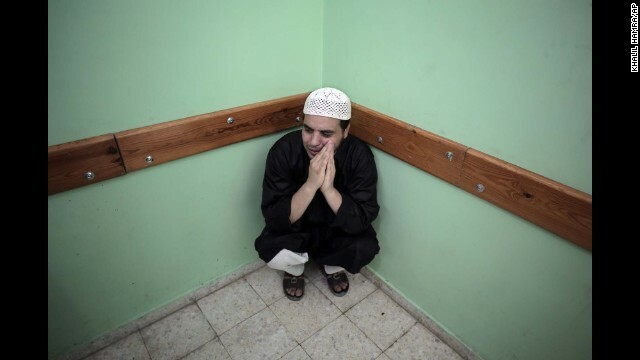 A Palestinian man sits in a hospital in Rafah, Gaza, on August 3. 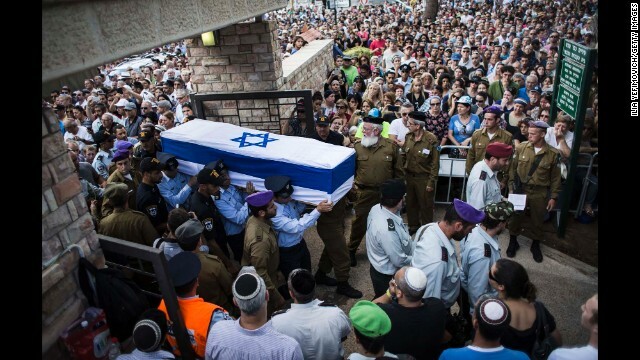 An honor guard caries the coffin of Israeli Lt. Hadar Goldin during his funeral in Kfar-saba, Israel, on August 3. Goldin was thought to have been captured during fighting in Gaza but was later declared killed in action by the Israel Defense Forces. 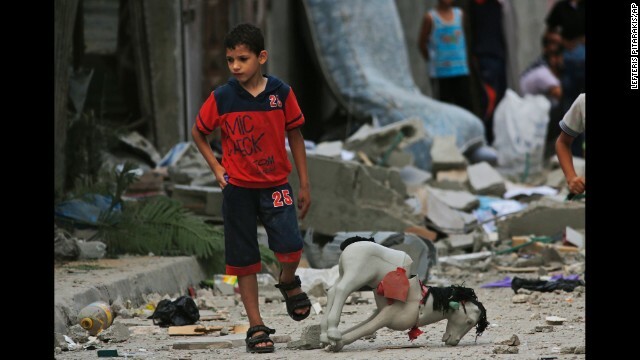 A Palestinian boy looks for belongings after an airstrike in Rafah on Saturday, August 2. Israeli soldiers walk to their tank at a staging area near the border with Gaza on August 2. A young Palestinian carries damaged copies of the Quran from the rubble of the Imam Al Shafaey mosque in Gaza City on August 2. 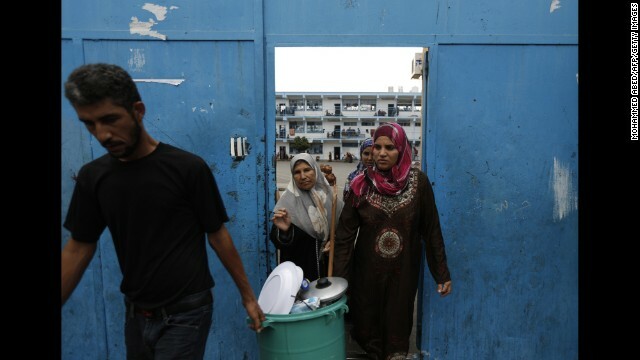 Palestinians displaced from their houses return to check their homes in Gaza City on Friday, August 1. An Israeli soldier carries a shell as he prepares a tank along the Israel-Gaza border on Thursday, July 31. Israel called up 16,000 additional reservists, bolstering forces for its fight against Hamas, the militant group that controls Gaza. Smoke rises from a building after an airstrike in Rafah on July 31. 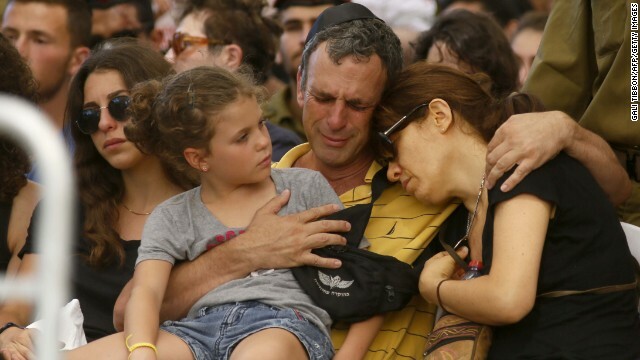 The parents and a sister of Israeli soldier Guy Algranati mourn during his funeral in Tel Aviv on July 31. U.N. workers remove a donkey injured at a U.N.-run school in Gaza on Wednesday, July 30. 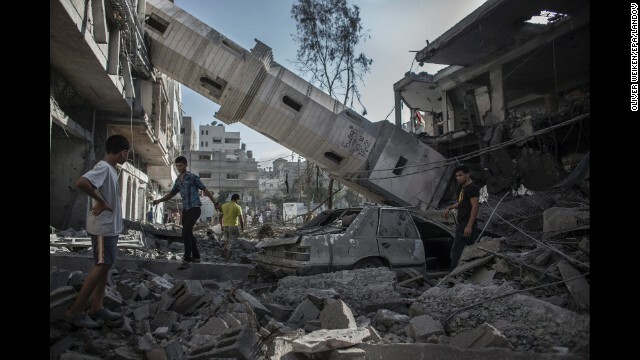 Palestinians walk under the collapsed minaret of a destroyed mosque in Gaza City on July 30. 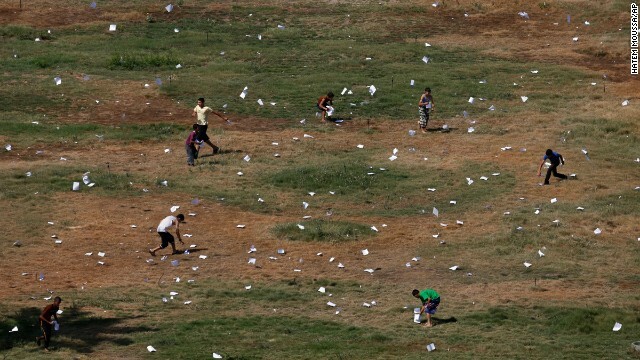 Palestinians gather leaflets that fell from an Israeli plane on July 30. The leaflets warned residents of airstrikes in Gaza City. 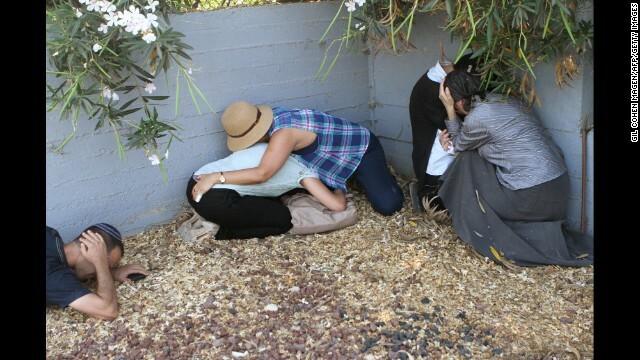 Israelis take cover from a Palestinian rocket attack from Gaza during the funeral of Israeli soldier Meidan Maymon Biton, which was held at a cemetery in Netivot, Israel, on Tuesday, July 29. 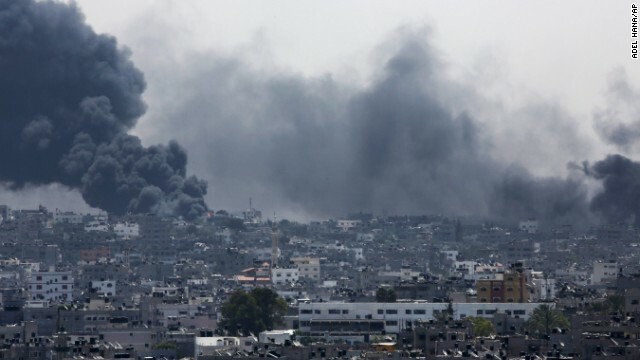 Smoke and fire rise above Gaza City after an Israeli airstrike on July 29. 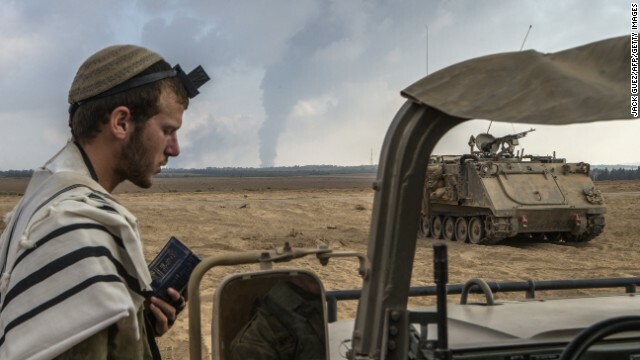 An Israeli soldier prays on the Israeli side of the border with Gaza on July 29 as smoke billows from the only power plant supplying electricity to Gaza. Near the rubble of their home in Rafah, Palestinian men mourn July 29 for people killed during an airstrike. 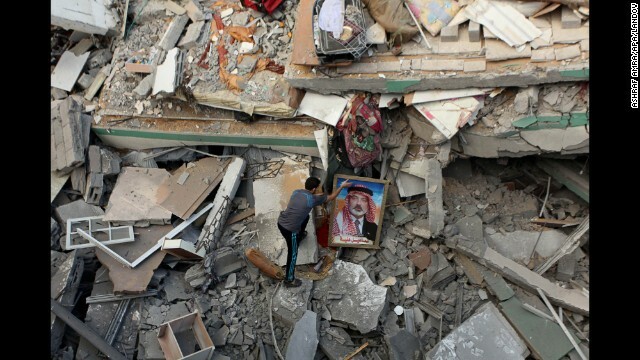 A Palestinian man places a portrait of Hamas leader Ismail Haniya on the rubble of Haniya's Gaza City home July 29 after it was hit by an overnight airstrike. 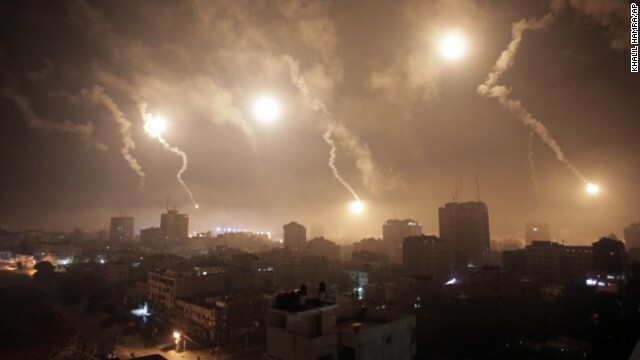 Flares from Israeli forces light up the night sky of Gaza City on July 29. 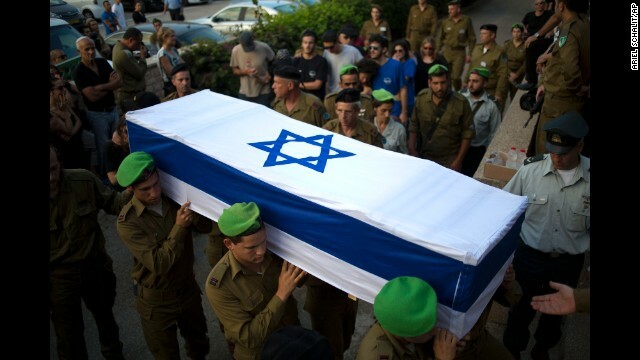 Israeli soldiers carry the coffin of 2nd Lt. Roy Peles, an infantry officer who was killed in combat, during his funeral in Tel Aviv on Sunday, July 27. 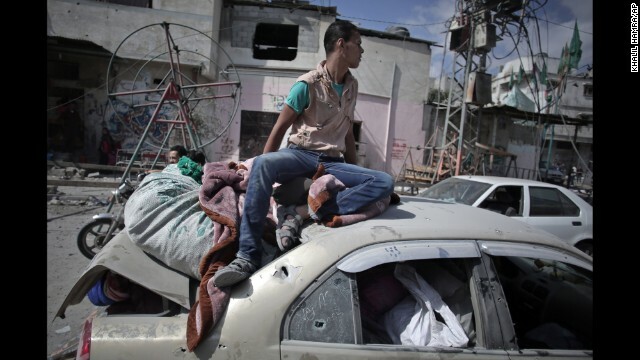 During a 12-hour cease-fire in Gaza City's Shijaiyah neighborhood on Saturday, July 26, a Palestinian man sits atop a car filled with belongings that were salvaged from a destroyed home. 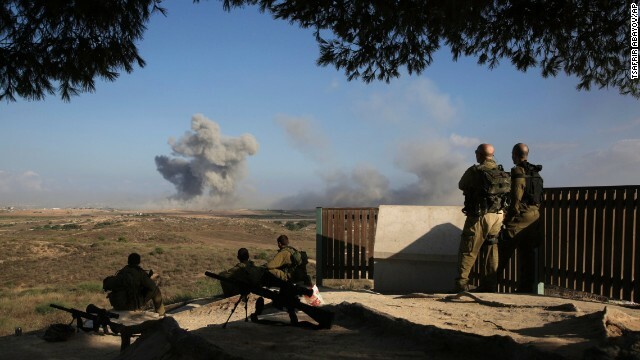 Israeli soldiers watch a bomb explode along the border with Gaza before the 12-hour cease-fire on July 26. 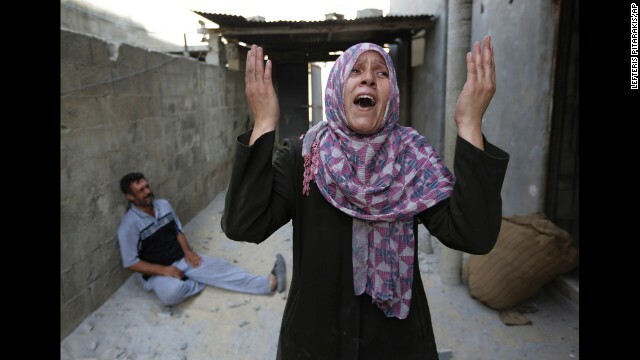 As her brother-in-law Mazen Keferna weeps on the ground, Manal Keferna cries upon discovering her family home destroyed by airstrikes in Beit Hanoun on July 26. 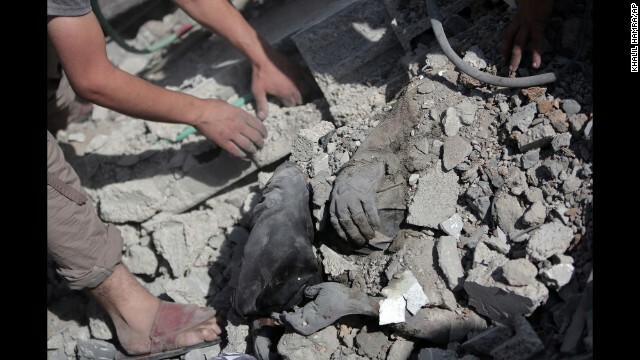 Palestinians dig a body out of the rubble of a destroyed house in Gaza during the cease-fire on July 26. 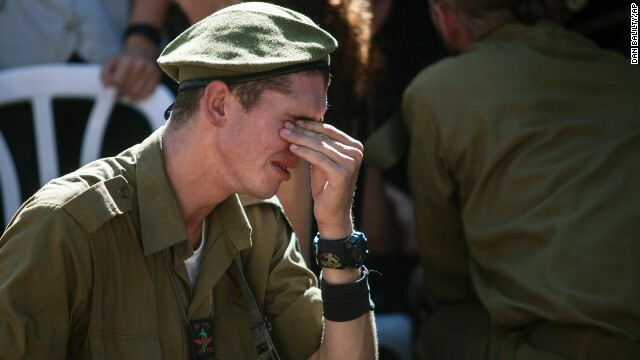 An Israeli soldier mourns at the grave of reserve Master Sgt. Yair Ashkenazy during his funeral at the military cemetery in Rehovot, Israel, on Friday, July 25. 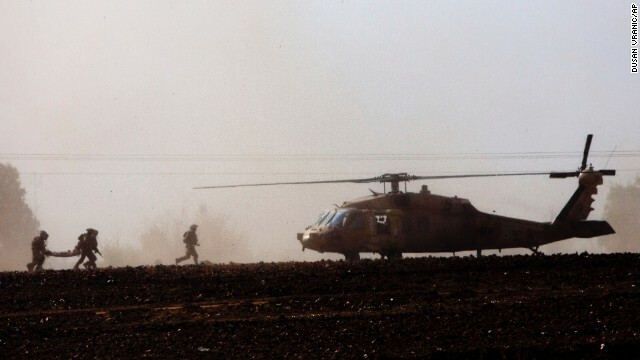 Ashkenazy was killed during operations in northern Gaza, the Israel Defense Forces reported. 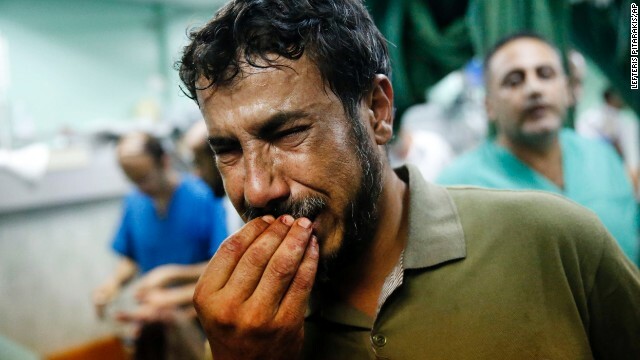 A Palestinian man cries after bringing a child to the Kamal Adwan hospital in Beit Lahiya on Thursday, July 24. 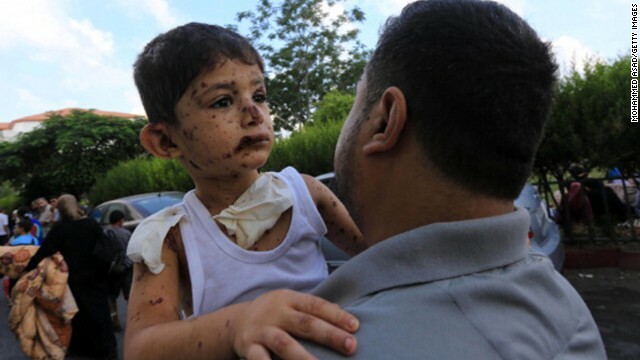 The child was wounded in a strike on a school that was serving as a shelter for families in Gaza. It's unclear who was behind the strike. The Israeli military said it was "reviewing" the incident, telling CNN that a rocket fired from Gaza could have been responsible. Israeli soldiers carry a wounded soldier to a helicopter near the Israel-Gaza border on July 24. Israeli soldiers patrol the Israel-Gaza border on July 24. 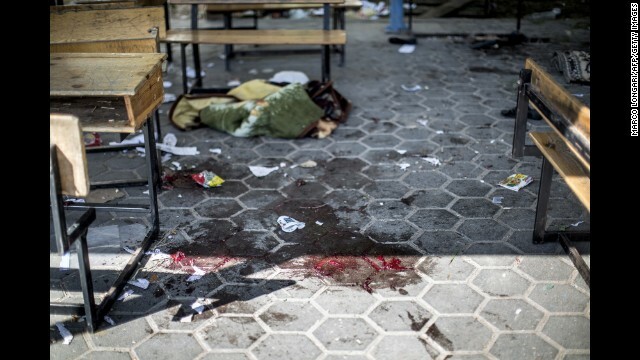 A trail of blood is seen in the courtyard of the school that was hit July 24 in the Beit Hanoun district of Gaza. 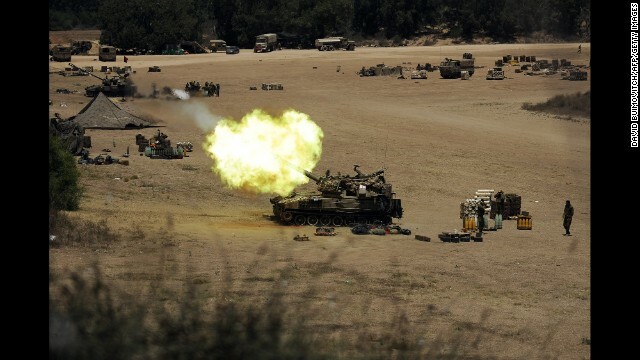 An Israeli tank fires toward Gaza from a position near Israel's border on July 24. 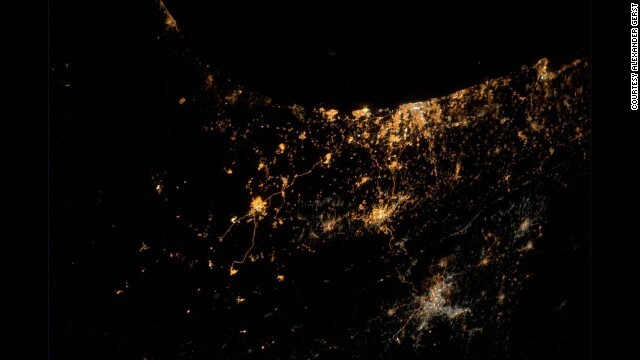 A photograph tweeted by astronaut Alexander Gerst on Wednesday, July 23, shows major cities of Israel and Gaza. Gerst said in his tweet: "My saddest photo yet. 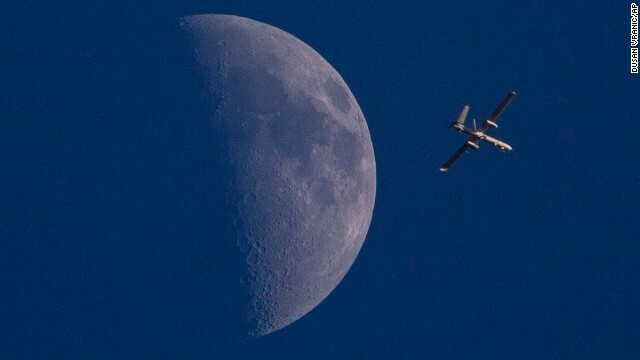 From #ISS we can actually see explosions and rockets flying over #Gaza & #Israel." 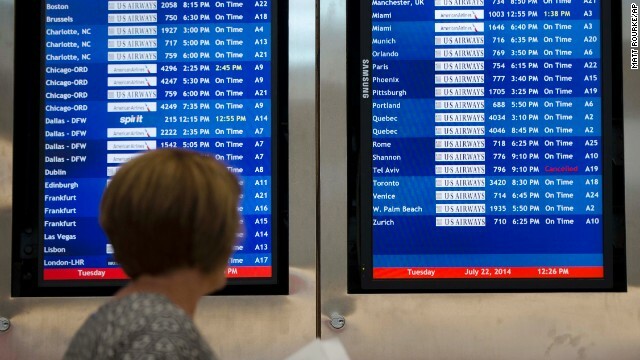 A woman in Philadelphia passes by a departure board that shows US Airways Flight 796, scheduled to fly to Tel Aviv, has been canceled on Tuesday, July 22. The Federal Aviation Administration told U.S. airlines they were temporarily prohibited from flying to the Tel Aviv airport after a Hamas rocket exploded nearby. 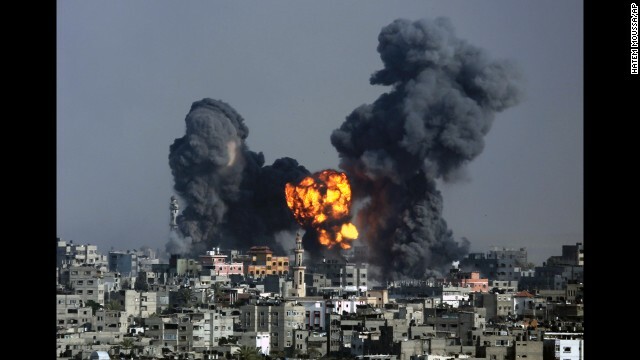 Smoke and fire from the explosion of an Israeli strike rise over Gaza City on July 22. 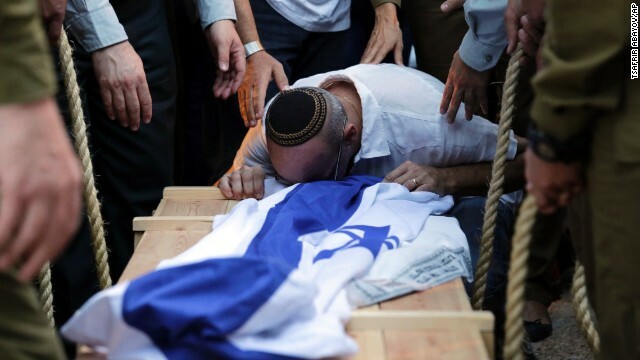 A relative of Israeli soldier Jordan Ben-Simon mourns over his coffin during his funeral in Ashkelon, Israel, on July 22. 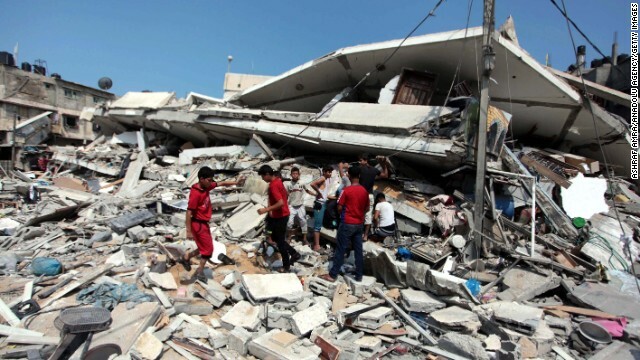 Palestinians inspect destroyed buildings and collect usable items after an Israeli air assault on July 22. 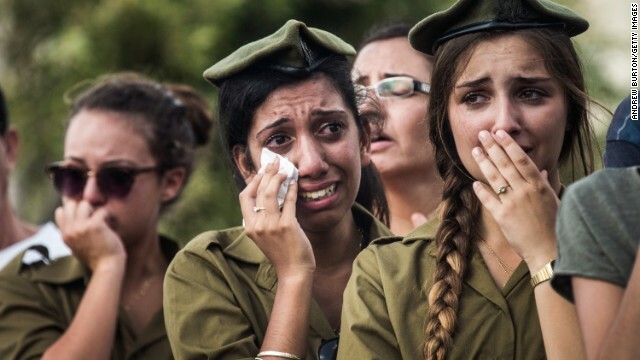 Israeli soldiers weep at the grave of Israeli Sgt. 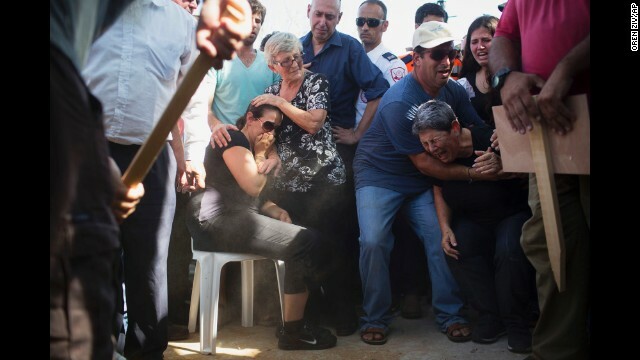 Adar Barsano during his funeral Sunday, July 20, in Nahariya, Israel. 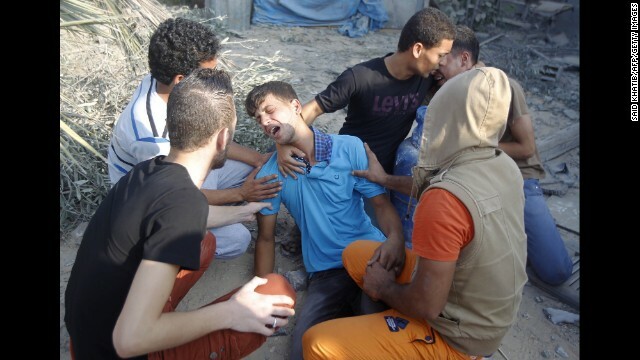 Palestinian medics carry a body in Gaza's Shaja'ia district on July 20. Israeli soldiers give medical care to soldiers who were wounded during an offensive in Gaza on July 20. A Palestinian boy injured during an Israeli airstrike is taken to the hospital by his father in Gaza City on July 20. 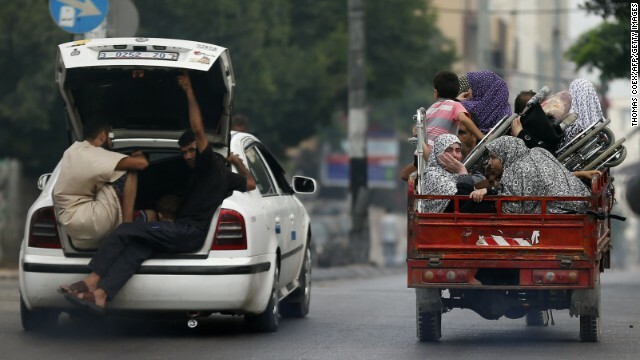 Palestinians flee their homes as Israeli troops focus their firepower on the Gaza town of Shaja'ia on Sunday, July 20. 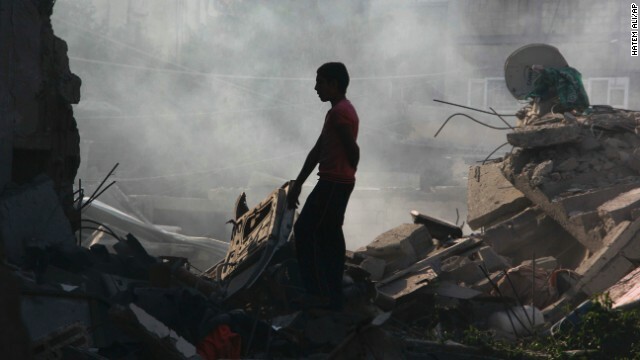 The shelling and bombing killed at least 60 people and wounded 300, according to the Gaza Health Ministry. 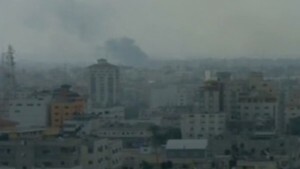 Smoke rises after an Israeli missile hit Shaja'ia on July 20. A Palestinian child walks on debris from a destroyed house following an overnight Israeli strike in Beit Lahiya on Saturday, July 19. 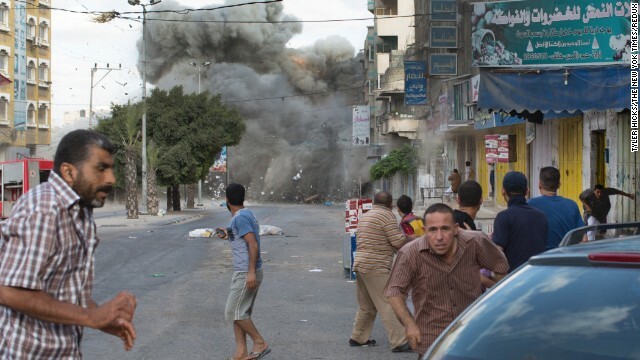 An explosion rocks a street in Gaza City on Friday, July 18. 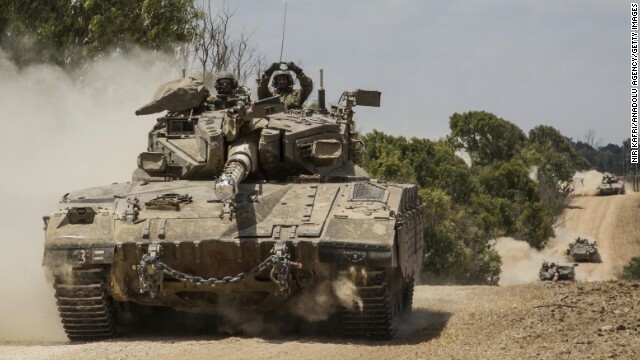 Israeli ground forces move to the Gaza border on July 18. 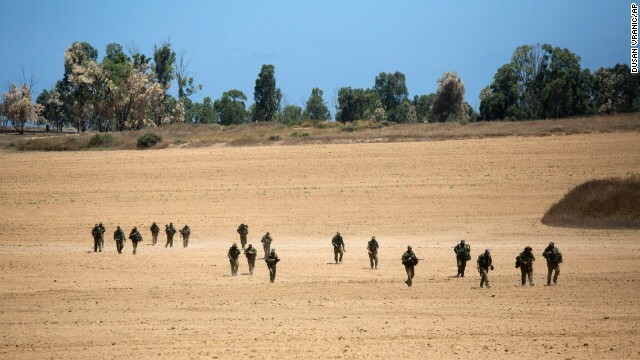 Israeli soldiers patrol near the Israel-Gaza border on July 18. 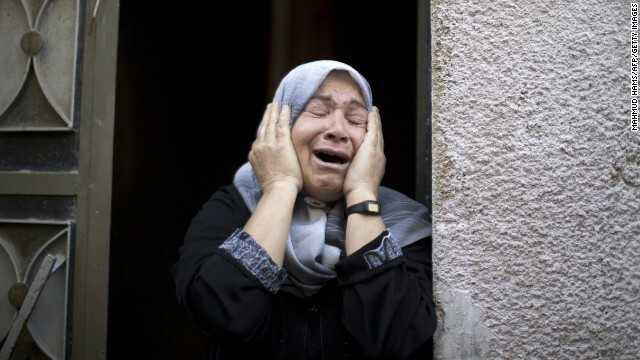 A relative mourns July 18 during the funeral of Rani Abu Tawila, a Palestinian who was killed in an Israeli attack on Gaza City. 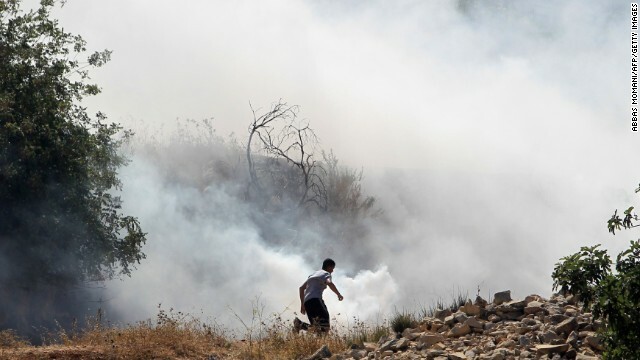 A Palestinian demonstrator, protesting Israel's military operation in Gaza, runs through smoke July 18 during clashes with Israeli soldiers at the entrance of the Ofer prison in the West Bank village of Betunia. This image, made from video shot through a night-vision scope, was released by the Israeli military on July 18. It shows troops moving through a wall opening during the early hours of the ground offensive in Gaza. 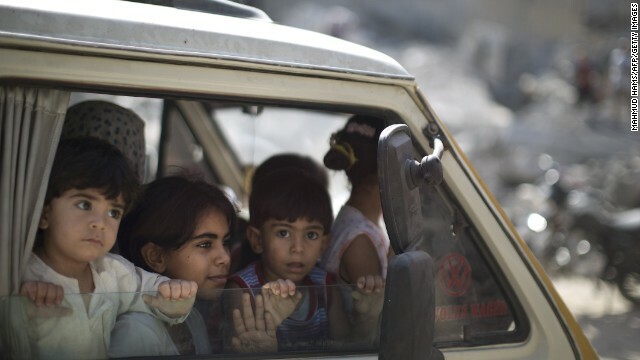 Children stare as Palestinians flee Khan Yunis, Gaza, to safe areas July 18. 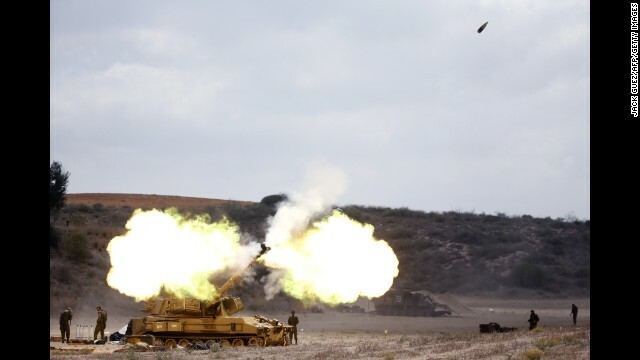 An Israeli tank fires a shell into Gaza on July 18. A Palestinian carries a gas cylinder salvaged from the rubble of an apartment building after it was hit by Israeli fire on July 18. 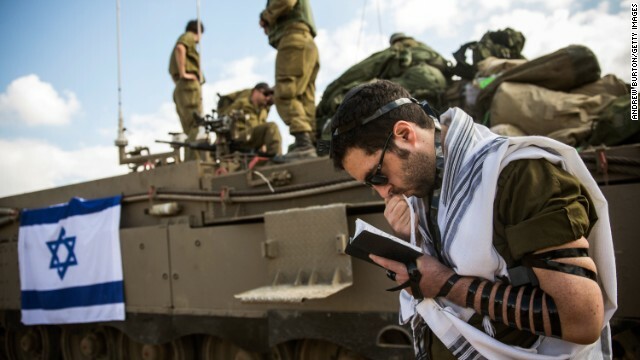 An Israeli reservist prays July 18 near the Gaza border by Sderot, Israel. Flare smoke rises into the Gaza City sky on Thursday, July 17. 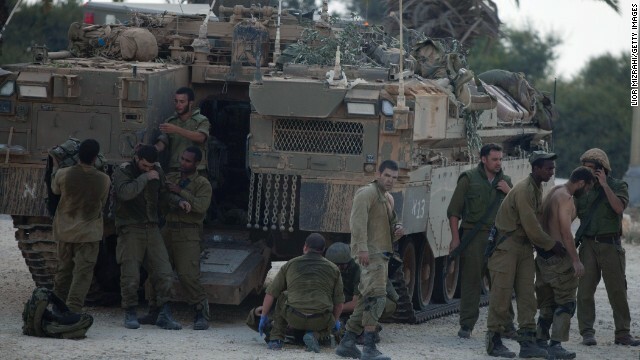 In total, 27 Israeli soldiers have died, including three believed killed by friendly fire. Nine of the soldiers were killed Monday. Four were on Israeli soil, killed as a result of infiltration by Hamas operatives, the Israel Defense Forces said. Two of the soldiers who died over the weekend were dual Israeli-American citizens: California native Max Steinberg and Sean Carmeli, from South Padre Island, Texas, the U.S. State Department said. 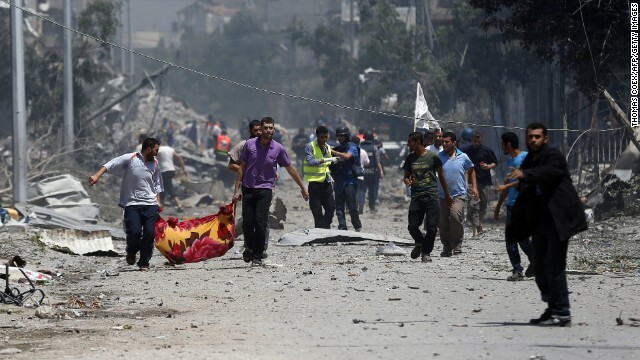 Two Israeli civilians have also been killed. Israel's Iron Dome defense system helps protect its residents from missile attacks. The Shuhada Al-Aqsa hospital in central Gaza was hit by shelling, leaving five people dead -- one patient and four relatives, the Gaza Health Ministry said. 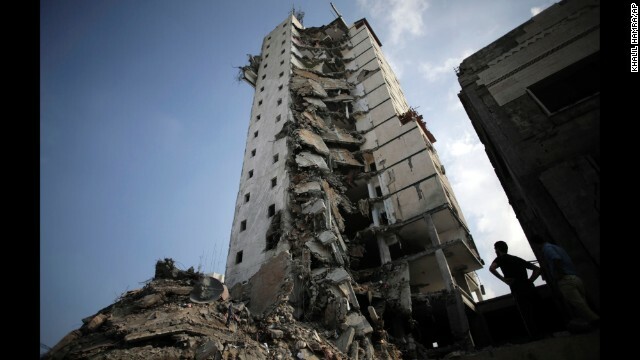 Hamas TV showed upper floors damaged. Israeli Justice Minister Tzipi Livni told CNN that the reports of hospital shelling are being questioned, "and we will make all the facts found public." 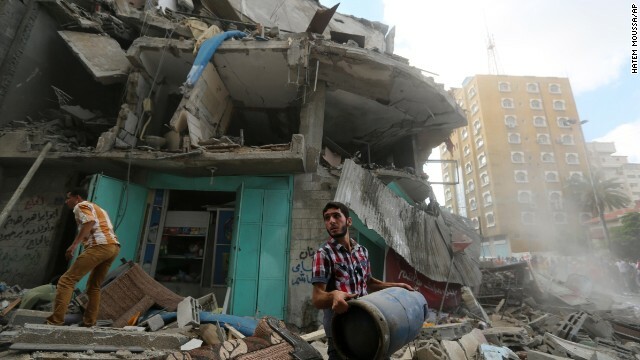 The Israel Defense Forces said an initial investigation shows that a cache of missiles was stored in the immediate vicinity of the hospital and was targeted. "Civilian casualties are a tragic inevitability of the brutal and systematic exploitation of homes, hospitals and mosques in Gaza," the IDF said. 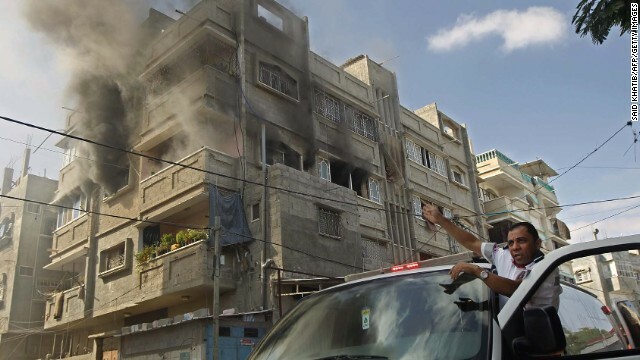 "While the IDF takes every possible measure to minimize civilian casualties, Hamas and its deliberate tactic of embedding terrorist activities within the urban environment is ultimately responsible." 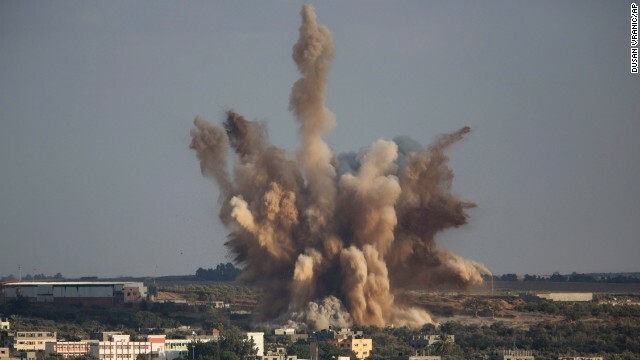 Israel also blames Hamas for other civilian deaths in Gaza, noting that the group has encouraged people to stay in their homes despite repeated warnings from Israel in advance of airstrikes. But some Palestinians have said they feared that even if they left they could face the same violence anywhere in Gaza. 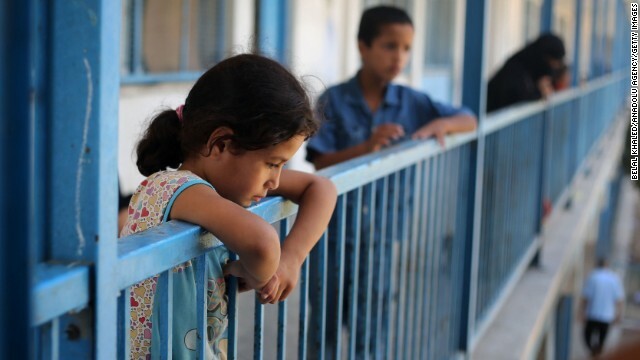 More than 83,000 Palestinians have taken refuge in U.N. facilities. 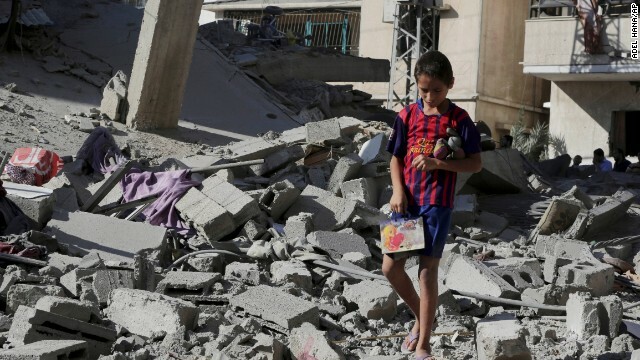 "Nobody is safe and nobody can flee anywhere because everywhere is targeted," said Enas Sisisalem, a mother of two who lives in the al-Remal neighborhood of Gaza City. "When we hear the shelling my kids will cry." Palestinian lawmaker Mustafa Barghouti accused the Israeli government of "acting in a criminal way." "What happened in Gaza during the past 10 days is nothing but a massacre," he told CNN's "The Situation Room with Wolf Blitzer." 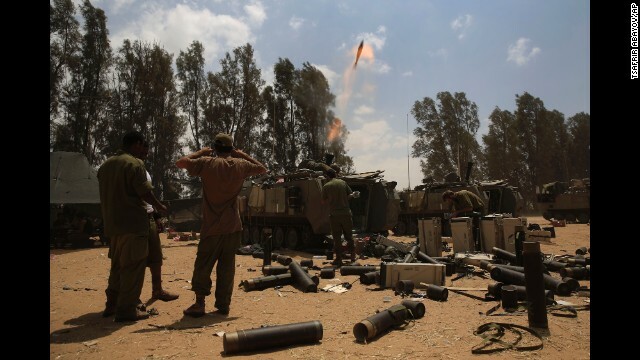 A rocket fired from Gaza struck a kindergarten, which was empty at the time, in the Israeli town of Sha'ar Hanegev, the IDF said. 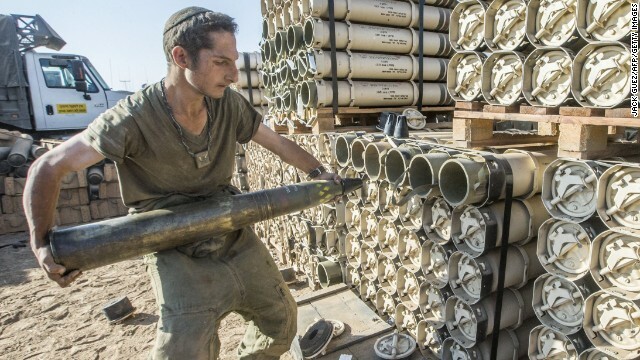 More than 2,000 rockets have been fired at Israel since the start of Operation Protective Edge, it said. 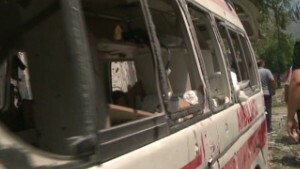 Hamas said Monday it had killed Israeli soldiers in an ambush and that the Hamas fighters were uninjured. It also said it successfully targeted Israeli troops in several places. 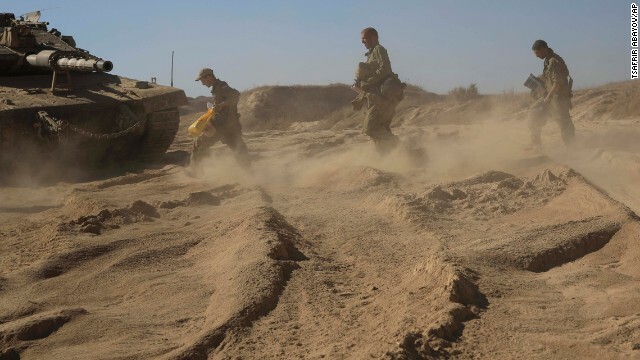 Israel killed more than 10 Hamas terrorists who entered the country through tunnels "to attack two different kibbutzim," or communal areas, "where farmers are trying to conduct their daily lives," government spokesman Mark Regev told CNN. 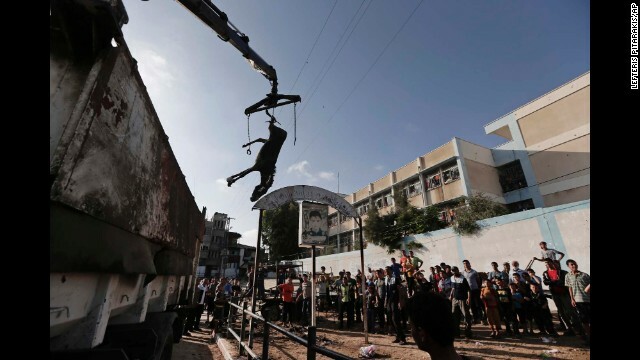 "We will see Hamas come out of this substantially weakened, their arsenal of dangerous weapons diminished," Regev vowed Monday in an interview with CNN's Wolf Blitzer. "They will understand they can't shoot at our people with impunity." And as the bloodshed continued Monday, U.S. President Barack Obama announced that he has instructed Secretary of State John Kerry to "push for an immediate cessation of hostilities." Kerry arrived in Cairo on Monday and said the United States would provide $47 million in humanitarian assistance to Gaza. The talks should focus on a return to the Gaza-Israel cease-fire agreement of November 2012, the President said at the White House. 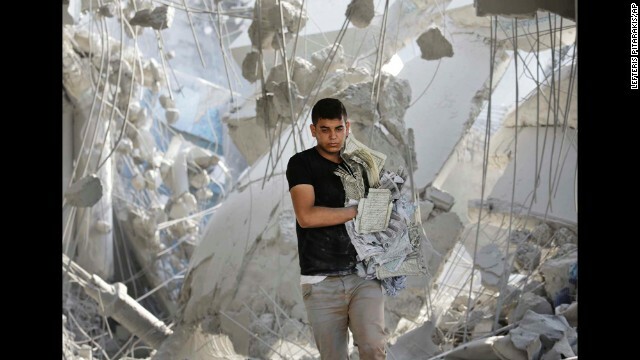 "We don't want to see any more" civilian deaths in Gaza or Israel, he said. 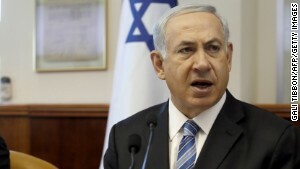 Israel has slammed Hamas for refusing to consider a cease-fire proposal made by Egypt last week. 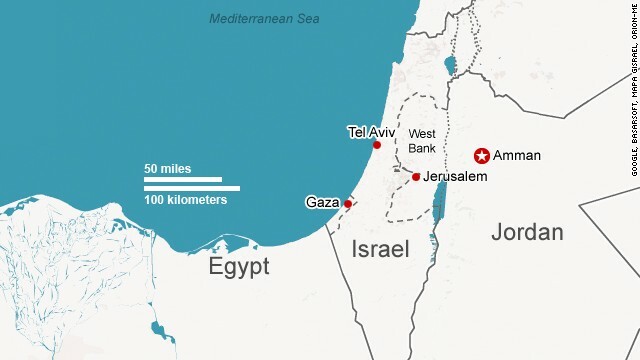 Senior Hamas political figure Izzat Risheq in Qatar told CNN on Monday that Hamas is not speaking directly with Egypt, but several other nations are involved: Turkey, Qatar, and Kuwait. Hamas political leader Khaled Meshaal traveled from Qatar to Kuwait on Sunday, Risheq said. Hamas postponed a scheduled news conference, at which Meshaal was going to speak, due to ongoing talks, Risheq said. Kerry told CNN on Sunday the United States has "shown our willingness to try to deal with the underlying issues," but Hamas "must step up and show a level of reasonableness." "No country, no human being, is comfortable with children being killed, with people being killed, but we're not comfortable with Israeli soldiers being killed either, or with people being rocketed in Israel," he said. While steadfastly supportive of Israel in public comments, Kerry appeared to let slip some frustration when caught on an open microphone between television interviews Sunday. After one of his deputies mentioned the latest number of Palestinian casualties, Kerry was heard to say, "It's a hell of a pinpoint operation." Obama spoke Sunday with Israeli Prime Minister Benjamin Netanyahu, the second call in three days. Obama reiterated U.S. condemnation of Hamas attacks against Israel "and reaffirmed Israel's right to defend itself," the White House said in a statement. Obama also "raised serious concern about the growing number of casualties, including increasing Palestinian civilian deaths in Gaza and the loss of Israeli soldiers." The United Nations is sending supplies into Gaza in what Chris Gunness, spokesman for the U.N. agency for Palestinian refugees, described as a "massive humanitarian airlift." "In the coming days, more airlifts are scheduled to arrive in Amman, from where (the U.N. agency) will truck the aid into Gaza for distribution," he said on Twitter. The IDF, meanwhile, tweeted, "While Hamas continues its attacks, tons of goods are reaching Palestinians in Gaza from Israel," including 148 trucks of food and medical supplies. 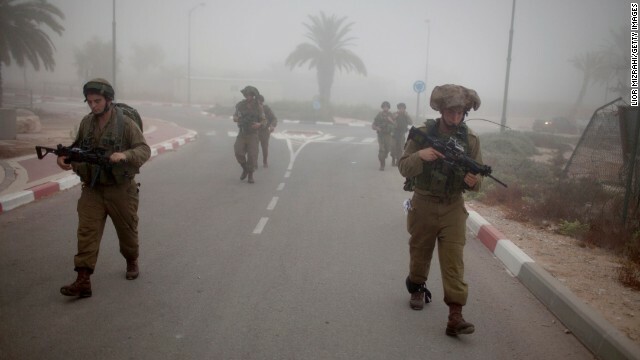 Hamas said Sunday it had captured an Israeli soldier. "He is a prisoner, and if Zionists lie about the dead and wounded, then the fate of this soldier is their responsibility," Hamas spokesman Abu Obeida said. Gunfire and cheers erupted in Gaza in apparent celebration of the soldier's capture. Israel's ambassador to the United Nations later disputed that claim. "There's no kidnapped Israeli soldier, and those rumors are untrue," Ron Prosor said. But Monday morning, the Israeli government said it was unsure. "It could just be Hamas bravado. We're looking into it," Regev said. "We don't underestimate Hamas. Hamas has built a formidable military machine. We see that with these rockets that they can shoot at the center of our country -- at Jerusalem and Tel Aviv. That network of tunnels under the Gaza Strip, there's a whole subterranean terror world there in Gaza. Some of those can go into Israel and pop up on our side of the frontier with arms, with explosives and can cause murder and mayhem on our side. 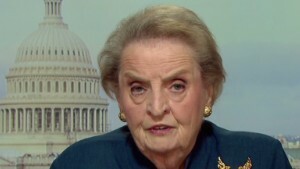 So we take the Hamas threat very seriously." If the claim is true, it will be "a game changer immediately because it's going to change what the Israelis are doing on the ground in that sector. 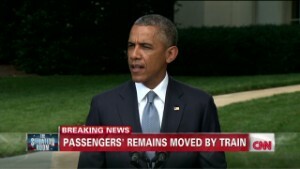 They're going to be looking for him," said CNN military analyst Lt. Col. Rick Francona. But, he added, "overall, the Israeli strategy is not going to change. They're committed to this mission." In 2006, Israeli soldier Gilad Shalit was captured. 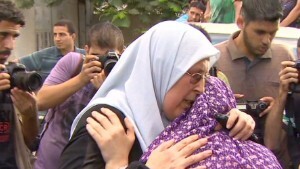 He was released some five years later in exchange for more than 1,000 Palestinian prisoners. The Lebanese militant group Hezbollah reached out to Hamas to express its support Monday. Hassan Nasrallah, the group's secretary-general, spoke with Hamas political chief Khaled Meshaal, who lives in Qatar. Nasrallah "praised the steadfastness of the resisters and their creativeness in the battlefield, the enormous patience of the wronged people of Gaza and their stand behind their resistance," according to a CNN translation of a Hezbollah statement. Nasrallah also spoke with Ramadan Shallah, head of Islamic Jihad, another Palestinian militant group, the statement said. Shallah is one of the FBI's most wanted terrorists. CNN's Karl Penhaul and Ian Lee reported from Gaza City, Josh Levs and Ali Younes from Atlanta and Jethro Mullen from Hong Kong. CNN's Kareem Khadder, Ben Wedeman, Atika Shubert, Ben Brumfield, Tim Lister, Michael Martinez, Mohammed Tawfeeq and Yon Pomrenze contributed to this report.